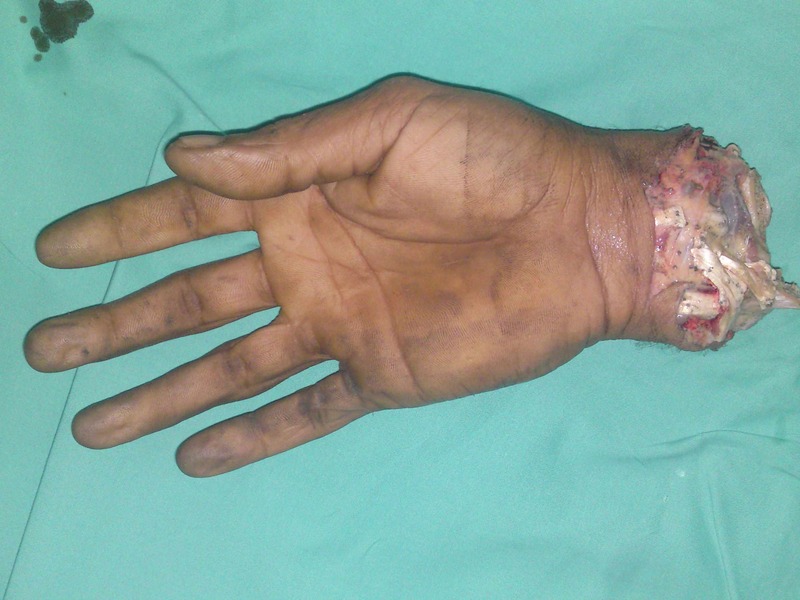 Nanda V, Jacob J, Alsafy T, Punnose T, Sudhakar VR, Iyasere G. Replantation of an Amputated Hand: A Rare Case Report and Acknowledgement of a Multidisciplinary Team Input. Oman Med J 2011 Jul; 26(4):279-282. Keywords: Replantation; Microvascular; Hand amputation. 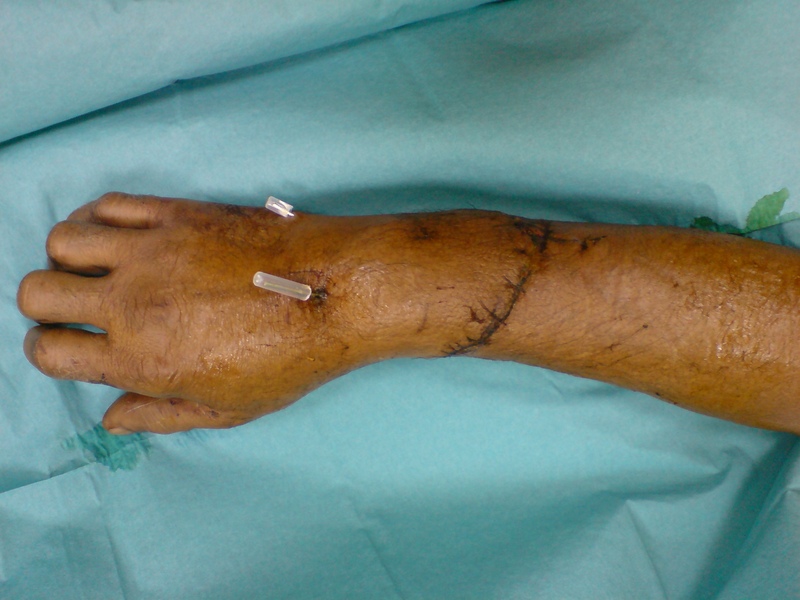 Replantation is defined as reattachment of the amputated limb using the neurovascular and musculoskeletal structures in order to obtain recovery of the limb. Since the first successful replantation of a human thumb reported by Komatsu and Tamai in 1968, thousands of severed digits and body parts have been successfully salvaged.1 The goal of replantation after traumatic amputation is successful salvage of the limb in both form and function. The simple return of circulation to the distal part does not in itself define success. The technical steps involved include examination and dissection of the neurovascular structures, bone fixation, tendon and muscle repair followed by microsurgical artery, nerve and vein repair, and finally skin closure. The hand is placed in a splint and the patient is monitored closely for circulatory changes in the fingers during the post-operative period. The decision to attempt salvage in such an injury has evolved and is influenced by many factors, including the importance of the part, level of injury, expected return of function, and mechanism of injury. The absolute contraindications to attempt salvage are existence of associated injuries or preexisting illnesses which may preclude transfer or a prolonged operation. Relative contraindications include vascular/nerve injuries at multiple levels and patients who are mentally unstable. Success rates are expected to be poor when there is a crush/avulsion injury as compared with a guillotine type of injury. Functional outcomes following replantation vary with the level of injury. Replants of the fingers distal to the flexor superficialis insertion, the hand at the wrist, and the upper extremity at the distal forearm can achieve good function.2-4 Results are better in younger patients. 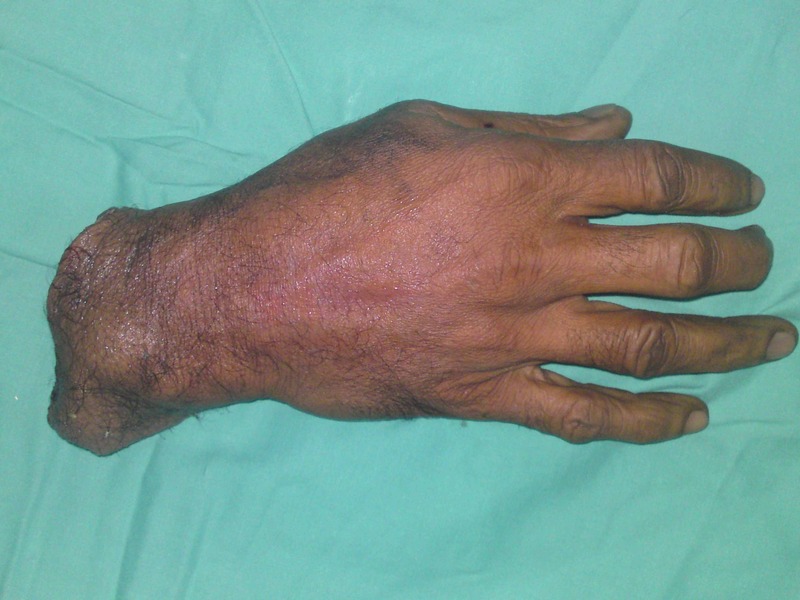 In this case report, we describe a middle aged male patient with an amputation at the level of distal forearm and the successful salvage of his hand by a multispecialty team. Figure 2: Amputated hand volar. Figure 3: Amputated hand dorsum. The patient was resuscitated and X-rays were obtained which showed an amputation of both the radius and the ulna in the distal third. The amputated hand was washed thoroughly with 4 litres of NS and carefully examined. A decision to attempt salvage was taken jointly with the orthopedic team and the consent was obtained from the patient after explaining the pros and cons and he was taken up for surgery immediately under GA. 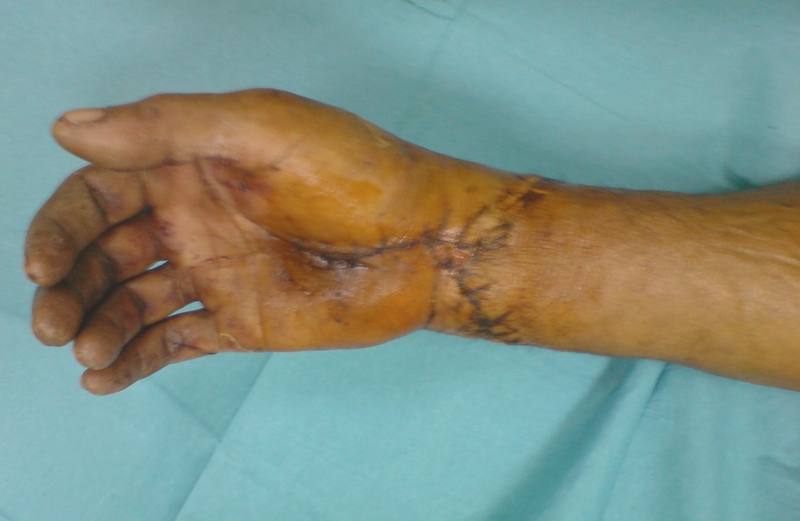 The raw area on the amputated hand was covered with saline soaked gauze and placed in sterile polythene, which was kept in an ice box for transfer to the OT. Bench surgery was performed on the amputated part by one team while the patient was being prepared for induction. It involved shortening of both bones by about 1.5 cm, debridement of the crushed tissues, and tagging of the arteries, veins and nerves. Ice packs were kept in the vicinity of the part until the vascular continuity was established. The stump was prepared by shortening of both bones by 1 cm, debridement of the crushed tissues, and tagging of the arteries, veins and nerves. A 3 mm K wire was passed through both the radius and the ulna. Additional interosseous wires were passed for improved stability. 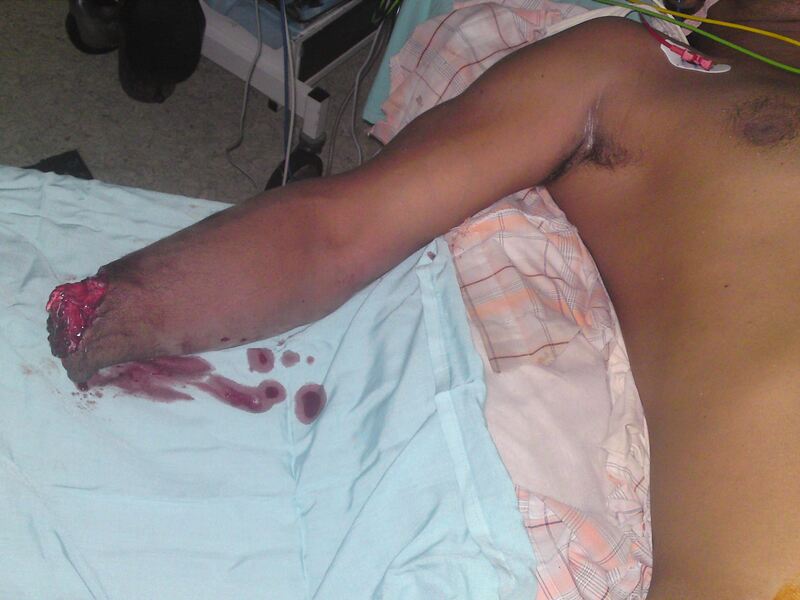 The ulnar and radial arteries were freshened and good bleed was confirmed. The ulnar artery repair was done and good backflow from the distal radial artery was observed. Arterial input was established around 4 hours following the injury. The tourniquet was now elevated and subsequent repairs of the median nerve, ulnar nerve, radial artery, and three veins - two on the dorsum and one on the volar aspect were carried out. All vascular anastomoses were done with 10-0 nylon under the operating microscope (Zeiss Opmi Vario). A distal incision through the thenar crease helped identify the distal structures and also served for carpal tunnel release. The tourniquet was periodically deflated to stay within the safe time limits. The tendons were repaired individually or mass repaired expeditiously to avoid undue delay. The surgery lasted eight hours and the patient recovered from anaesthesia uneventfully. The patient received a single dose of low molecular weight heparin intraoperatively, platelet inhibitor dipyridamole and aspirin for two weeks postoperatively. Antibiotics were also given for two weeks. His vitals, urine output and hand vascularity were monitored closely. All wounds healed and the patient was discharged after three weeks, (Figs. 4,5). At discharge, there was a flicker of movement in the fingers. The patient was advised on the need for regular follow up to assess the bony union, range of motion and nerve recovery. Further procedures that may be required for the tendons including repair/tenolysis/transfers, neurolysis for the nerves, selective arthrodeses and prolonged physiotherapy during the next 1 year have been explained to the patient. Figure 4: Replanted hand volar. Figure 5: Replanted hand dorsum. The goal of replantation after a traumatic amputation is successful salvage of the limb in both form and function. Various recommendations have crystallized from the experience in large series. When transferring the patient, ice placed in plastic bags should be placed in the vicinity of the distal part to reduce warm ischemia time. When the distal part is connected with a small bit of tissue it may be better to cut it off and the severed part should then be transported carefully. The severed part is to be covered with gauze moistened with saline, kept in a plastic bag and then placed in ice. Bleeding vessels in the stump should not be clamped and should be managed by compressive dressings and limb elevation. Preoperative preparation includes fluid resuscitation and warming to prevent vasoconstriction. Incisions are made to identify neurovascular structures which are carefully tagged and protected during the bony manipulations. Bone shortening is recommended to reduce the tension across the neurovascular repairs and for ease of soft tissue closure. Bone should be shortened on the amputated part and not the stump so as to retain the length should the operation fail. K-wires are placed commonly to fix the fracture. Postoperative care includes adequate fluids and warming the patient’s room to prevent hypotension and vasospasm. There are reports recommending the use of aspirin, dextran or heparin, however none are backed by a randomized control trial.8,9 The patient’s hand is monitored closely for signs of arterial insufficiency or venous congestion. Both situations often merit an urgent re-exploration and revision of the affected anastomosis. The outcome of surgery has to be assessed not only by the rate of limb survival but also by the functional result and patient acceptability. Most large series are a combination of patients who underwent replantation or revascularization. The field of replantation has become sophisticated over the last four decades. Awareness of the possibility of salvage should be spread among healthcare personnel. Timely intervention at every stage will help reduce ischemia time and thus improve the survival rates and the long term functional outcomes. The patient may need further surgeries and requires prolonged physiotherapy. With a committed patient and a dedicated team, we are hopeful of a good functional outcome. The success has been a morale booster for the entire team. 1. Komatsu S, Tamai S. Successful replantation of a completely cut-off thumb: case report. Plast Reconstr Surg 1968;42:374-377 . 2. May JW Jr, Toth BA, Gardner M. Digital replantation distal to the proximal interphalangeal joint. J Hand Surg Am 1982 Mar;7(2):161-166. 3. Russell RC, O’Brien BM, Morrison WA, Pamamull G, MacLeod A. The late functional results of upper limb revascularization and replantation. J Hand Surg Am 1984 Sep;9(5):623-633. 4. Vanstraelen P, Papini RP, Sykes PJ, Milling MA. The functional results of hand replantation. The Chepstow experience. J Hand Surg Br 1993 Oct;18(5):556-564. 5. Wei FC, Chang YL, Chen HC, Chuang CC. Three successful digital replantations in a patient after 84, 86, and 94 hours of cold ischemia time. Plast Reconstr Surg 1988 Aug;82(2):346-350. 6. Kour AK, Phone MH, Chia J, Pho RW. A preliminary report of tissue preservation with University of Wisconsin cold storage solution in major limb replantation. Ann Acad Med Singapore 1995 Jul;24(4)(Suppl):37-41. 7. Sabapathy SR, Venkatramani H, Bharathi RR, Dheenadhayalan J, Bhat VR, Rajasekaran S. Technical considerations and functional outcome of 22 major replantations (The BSSH Douglas Lamb Lecture, 2005). J Hand Surg Eur Vol 2007 Oct;32(5):488-501. Europ. 8. Tamai S. Twenty years’ experience of limb replantation–review of 293 upper extremity replants. J Hand Surg Am 1982 Nov;7(6):549-556. 9. Goldner RD, Urbaniak JR. Replantation. In: Green DP, Hotchkiss RN, Pederson WC, Lampert R, eds. Green’s Operative Hand Surgery Vol 1. 4th ed. New York, NY: Churchill Livingstone; 1999:1139-55. 10. Kleinert HE, Jablon M, Tsai TM. An overview of replantation and results of 347 replants in 245 patients. J Trauma 1980 May;20(5):390-398. 11. Hattori Y, Doi K, To S, Oi R. Results of Major Replantation of Upper Extremity. Journal of Japanese Society for Surgery of the Hand [Jap] 2002 18; 6:863-866. 12. Lutz BS, Klauke T, Dietrich FE. Late results after microvascular reconstruction of severe crush and avulsion injuries of the upper extremity. J Reconstr Microsurg 1997 Aug;13(6):423-429. 13. Sugun TS, Ozaksar K, Ada S, Kul F, Ozerkan F, Kaplan I, et al. Long-term results of major upper extremity replantations. Acta Orthop Traumatol Turc 2009 May-Jul;43(3):206-213.